Thrust blocking prevents main line from moving when the pressure load is applied. In efect, the thrust block transfers the load from the pipe to a wider load bearing surface. Thrust blocks are required where fittings are used to change the direction (i.e., at all ties, elbows, wyes, caps, valves, hydrants and reducers) of the pipeline. The thrust backing must be performed against a solid trench wall and these fitting areas must be excavated by hand because mechanical equipment will damage the bearing surface of the trench wall. The size and type of thrust block depends on pipe size, line pressure, type of fitting, degree of bend and type of soil. In most cases, the size and type of thrust block will be determined by the engineer. If size of thrust block has not been specified by engineer, it might be calculated by dividing the total thrust force by the bearing strength of the soil. This gives the square feet of area needed. The engineer is the responsible person for determining safe bearing loads (lbs. per square foot) and if doubt exists, soil bearing tests should be run. 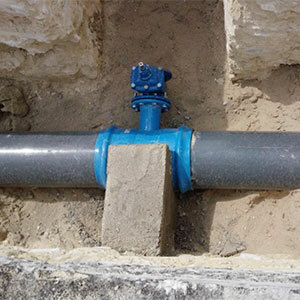 Thrust blocks are anchors placed between pipe or fittings and the solid trench wall. They can be constructed from availale lumber if braced properly. 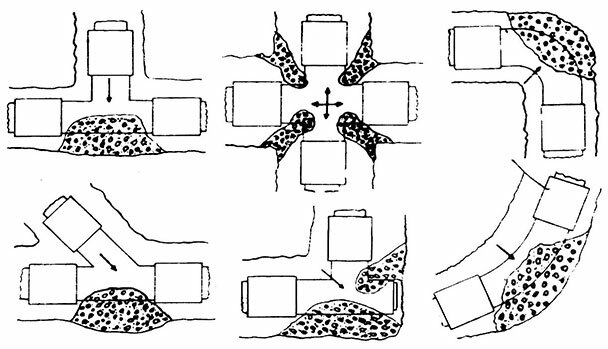 However, the recommended thrust blocking is concrete which is calculated to have a compression of 2,000 pounds per square inch. The mixture is one part cement, two pats washed sand and five parts gravel. Thrust blocks should be constructed so the bearing surface is in direct line with the major force created by the pipe or fitting. The earth bearing surface should be undisturbed. Only the simplest of forms is required.